Molino Villas of Moraira, have always been a pleasure to work with. They actually listen to your requirements, and are always attentive to your needs. I would always advise a chat with them, should you be looking for a home in this area of the Costa Blanca., as it is always their aim, to find you the perfect property. We have just moved into our new house bought via Molino Villas. We have know this Company for many years now and give them a Five Star recommendation for the help they provide in searching for your new home. Nothing is too much trouble and unlike other Agents, they listen to what your want and find the right properties to show you. Molino Villas are a family run Agency and we cannot recommend them highly enough. A special thanks to Paul, who always goes the extra mile and is one of the nicest guys to work with. Finding and buying a property or plot in Spain can all be a bit daunting and finding professional people to work with can be challenging. Paul at Molino was without question the most professional agent we met during our search. He helped in areas beyond his remit as an agent and gave us his time and energy beyond what could be expected. He even introduced us to other contacts who have proven to be very helpful. We ended up buying a plot in the Jalon Valley and we are looking forward to building our new home in the coming months. Many thanks to Paul and Molino Villas. This is the third property we have bought in Spain and we were pleasantly surprised by the unexpectedly good service we had from Molino Villas. From our first viewing of the property up until accompanying us and the vendor to the Notary's office for completion, nothing was too much trouble for Paul. We had a lot of questions, which were always answered immediately and he was always happy to open up the house for us for viewings and builders' quotes, etc. We would wholeheartedly recommend Paul and the team at Molino Villas if you are buying or selling in the Moraira/Javea area. We can very much recommend Molino Villas for selling and buying,they did a perfect job for us.Thanks especially to Angela and Gabriella. Outstanding service as nothing was too much trouble. 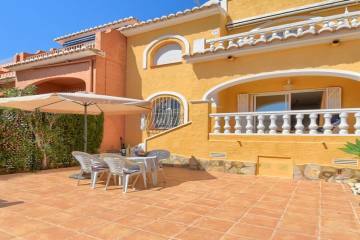 Molino villas make the complex process of selling a property in Spain idiot proof. Always explaining things carefully and getting the best for their clients whilst supporting them in a friendly way. I would not hesitate to highly recommend them. A friendly family business that helped us every step of the way to a successful conclusion in the sale of our bungalow at Castellans Vida. The team assisted us, not only with marketing, but also with Spanish red tape without the need for us to seek further legal advice. We would have no hesitation, based on our personal experience, in recommending Molino Villas. After attempting to sell privately, we placed our apartment with Molino Villas and achieved a sale in a relatively short period being updated by the team at Molino after each viewing. Vivienne and her team advised us of the all documentation required and helped with the process all the way through to the final visit at the notary office to complete the sale. After experiencing the efficient and friendly service from Molino, we recommended them to our friends and they have completed the sale of their apartment too. Many thanks to Vivienne, Paul and Angela. Highly recommended. Our villa in Moraira was on the market for a long time but Molino arranged several viewings in that time so their advertising works extremely well. When they eventually found a buyer for us the whole process of selling our much loved property was handled by Angela and Vivienne who couldn't have been more helpful, pleasant and efficient. We live in the UK so most of the work in selling the property was done by email and phone calls. We didn't have to go out to Moraira until the week the property was handed over to the new owners and we were even driven to the Notary's office in Denia by Angela. The sale was a 100% success with no hiccups and no stress, thanks to Angela and Molino Villas. We would not hesitate in recommending their services. We can't thank the team at Molino Villas enough, they are extremely efficient, professional and go out of their way to help and assist should you need it. Their friendly approach and knowledge of the property market in the area is second to none. Due to our long list of requirements, we thought it would take weeks to find the property we were looking for, however the team at Molino Villas quickly narrowed down the properties that matched our criteria, chauffeured us around to look at properties and the local area, and offered advice and support when we needed it. Within 2 days they had located our dream property (which we have now purchased), leaving us the remainder of the week to relax and enjoy Spain. Thank you Molino Villas! You have saved us time, money, and made the whole process simple and enjoyable. We wouldn t be in Spain without you! We recently purchased an apartment through Molino Villas's agency. We would like to thank you and express our satisfaction. With kindness and patience Martine was able to understand our wishes and to be available to show us many homes. In less than a week before our return to France our choice was made. For 2 months and until the deed at the notary, Martine helped us along with the paperwork required. Considering the difficulties of buying a property abroad, her effective assistance was welcome and valuable. In May we had two lovely weeks in Moraira. We are very excited about our new home and fully satisfied with the services of Molino agency. We have very good memories of Martine and Mike who we spoke to the day we made our choice. We send our best regards to the employees of Molino agency. Our move went so well. Just to say a big thank you once again, you all made a very stressful time for us so much easier, you helped us through every step of the way with your professionalism and friendliness and we would highly recommend you. Now that David and I have returned to the UK we want to thank you for your efforts on 24 March to make our visit to Moraira both useful and enjoyable. we really appreciated your efforts to put together a programme that was full of interesting properties. The professionalism and good humour you put into the morning were really remarkable - we were particularly impressed by the way you immediately recognised the sort of properties and locations that would interest us. In this way you've both widened our scope in terms of properties, and narrowed our focus in terms of location, shaving a lot of time off our research, which is of course invaluable. We're confident that we'll settle on Javea and environs. Thanks to the unstinting efforts of the team at Molino Villas in Moraira, I have recently successfully concluded the sale of my Apartment on Castellons Vida in Teulada. From the time I first met Angela and Vivienne I have always been extremely well advised by them, they have kept me in constant touch with developments I reside in the UK - and they, and indeed their colleagues, were always exploring new ways to promote and market my property. On the day I got the call to say 'we have sold your property' they were incredibly supportive and did everything possible to make the whole sale as smooth and speedy as possible. As we are all only too well aware, it really is a stressful time so much to do, some of it quite complex - and I was just so delighted to have Molino Villas assisting me all the way, right up to the day we all arrived at the Notary to finalise the sale. I am genuinely hugely appreciative for all that Molino Villas achieved for me and I would strongly recommend that if you are contemplating 'Buying' or 'Selling' in this part of Spain in the first place, you should get in touch with Molino Villas. I have been very impressed by Molino Villas' professionalism, as well as the rigour in following up all the files by our correspondent Martine. Thank you again to the whole team.